Meet José (aka PilotOne) from Portugal. He’s a flight simulator fan, and an enthusiastic member of the Postcrossing community in Portugal – he even gave an interview about Postcrossing on TV once! I joined the Postcrossing project on the 30th September 2009 and in fact I can’t remember how I learned about it! I believe however that it was through any article I read online. What keeps me active on the project is to become aware of other cultures, languages​​, ways of living and even some cases of life that are reported by some of the members in their profiles. To share all this is what fascinates me most in Postcrossing. Yes, although Postcrossing occupy some of my free time, I enjoy modeling and also dedicate much of my time to virtual aviation with my own flight simulator equipment. Photography and reading a good book are also habits that I practice very regularly. This is my favorite! 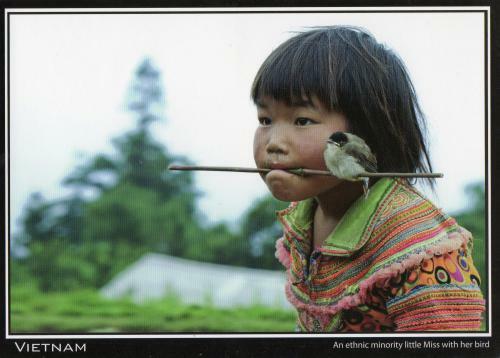 It shows an ethnic little girl and it really is one of the most touching cards I’ve received so far! I’m sure this little girl’s world is limited to her small bird and to the 50 or 100 meters surrounding the place where she lives! 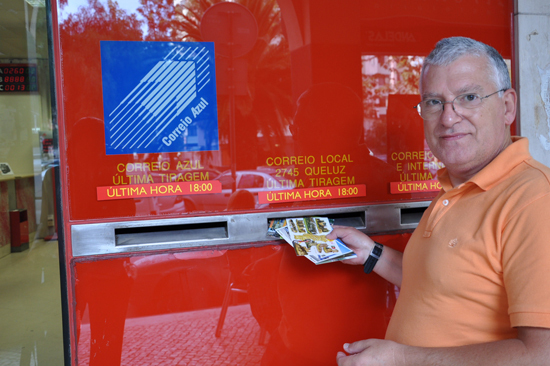 When I gave a TV interview about Postcrossing in October 2010 and we all felt a marked increase of new subscribers in Portugal, so I hope some of them have really got addicted to the project. Personally I also contributed to the dissemination of the project by friends, explaining them how everything works from the first requested addresses. 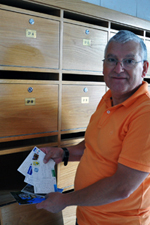 The most exciting and favorite moment is to read the cards I receive and also to the countries they are coming from. Registration process is also a big moment, as I can 'see’ (most of the times) the photo of the sender and also read his/her profile. I’ve been very excited when I received a card from Paraguay with a small ID. At that time I’ve checked the Postcrossing registration system and it was the 1st card from Paraguay received in Portugal. You can see it here. My recently sent PT-266410 (still traveling) to Liechtenstein also made me happy as there are only 4 Postcrossing members on this Principality, so there was a very small chance for this to happen! Yes many times! I use to attend local small meetings or just combine to have lunch or a dinner together with some members (we call it a meeting!) where we always finish with a card-writing session! I’ve also attended different International Postcrossing Meetings in Portugal that really had a large number of foreign members! I've sent a postcard to PilotOne . He is a man of hospitality and he upload the detailed description of the postcard you sent . Thank you very much for the article and the photos, I enjoyed reading it. These articles give a face to Postcrossing, and I always wait for a new one. I haven't played Flight Simulator for 13 years or so! I wasn't a good pilot! Maybe one day, I will send you a postcard and tell you all about my flights! Great interview, thanks for sharing this all with us. The card from Vietnam is definitely very very special! i enjoyed your description of the "rare" country ID and surprise! Great interview. I love to see the Post Offices and boxes. There are so many different ways of sending cards. Interesting to read about other postcrossers. Thanks for sharing! I love the questions, and the answers that vary every time. great interview - Your favorite card is fantastic! Hello Jose! It's very nice meeting you through your wonderful interview. Your favorite postcard is beautiful and touching. Thanks for the great interview. Fine you have so many postcrossing-friends met by you in real life. Thanks for sharing your story! Both my daughter and I have received postcards from Jose - wonderful additions to our collections! I would wish to thank you all for your generous comments to my interview. Your nice words will certainly contribute to make Postcrossing grow more and more! Thanks! SO great to see here a person you pften meet on forum:) very nice story! best wishes! Hello PilotOne :) Nice to see you in the spotlight.! I still remember how I met you first time: through Hangman-game. hi, pilotone, nice to see you and get common with you! you are so professional in storing your cards!!! I wish I could be the same as you, but I have my cards to sent in large laundry-baskets and the received cards still in cartons... :-((( thank you for sharing your story! So nice to "see" José here because we already exchanged some postcards through the forum. I still didn't meet you personally but hope to do it someday. Obrigada por representar tão bem o Postcrossing em Portugal! Lovely to meet José here and what a fabulous surprise having read this spotlight on José to receive an official card from him in the same week. Special. Many thanks again, José, for the spectacular card and I have a thank you card winging its way to you. It has been signed by other Postcrossers who attended a lovely meet-up in Dublin yesterday. Such an inspiring and happy interview, thanks, and greetings to all! Glad to see you here, Pilotone! Great article Zé :D Fly safe!